In order to afford a modest, two-bedroom apartment in Illinois, renters need to earn $20.34 per hour. 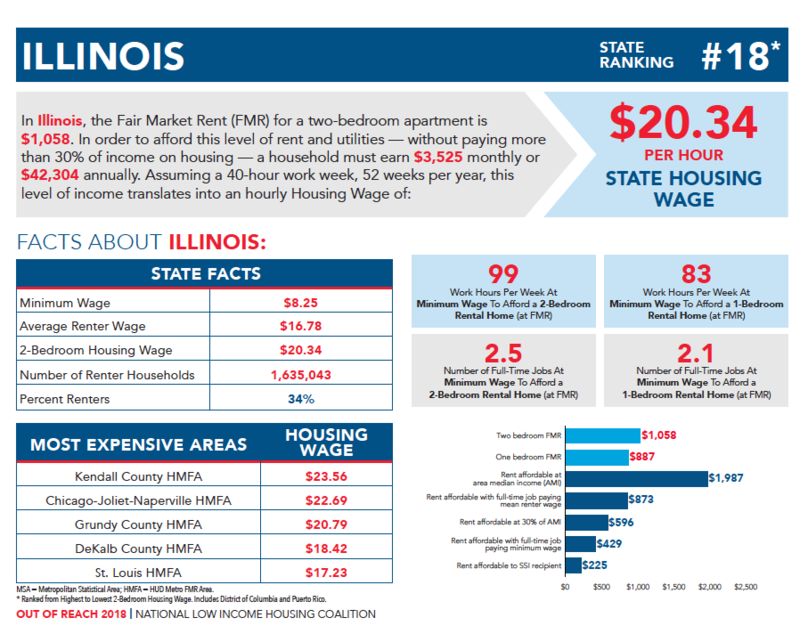 This is Illinois’ 2018 Housing Wage, revealed today in Out of Reach 2018: The High Cost of Housing, a national report jointly released in Illinois by Chicago-based Housing Action Illinois and DC-based National Low Income Housing Coalition. This means that to afford a two-bedroom home without paying more than 30% of their income on housing costs, a person earning Illinois’ minimum wage ($8.25 per hour) must work 99 hours per week just to make ends meet. The report calculates the Housing Wage for every county in Illinois. In none can a full-time minimum wage worker afford a modest two-bedroom apartment. Out of Reach 2018 finds that average cost of rent and utilities for a two-bedroom apartment in Illinois is $1,058 per month. In order to afford this, a household must earn at least $42,304 annually. Assuming a 40-hour workweek, 52 weeks per year, this level of income translates into a Housing Wage of $20.34. The cost of rental housing varies across the state, but there is no place in Illinois where a minimum wage worker can afford a two-bedroom apartment. Rental housing is the most expensive in Kendall County, where the Housing Wage is $23.56, followed by the Chicago metropolitan area, where the Housing Wage is $22.69. The lowest that the Housing Wage gets for an average two-bedroom apartment in Illinois is $12.88, which is still more than 1.5 times the minimum wage.